The fruit or vegetable I’ve chosen to explore is the pomegranate. Pomegranates have a yellow-ish rind covered with light pink, deep pink or rich red overtop. The colour pink is a variation of red, red being a primary colour. The berries are a deep red. The colour carries many cultural and psychological associations in North America and most of the world, such as: danger, heat, passion, sacrifice, anger, courage, speed, stopping and love. In Asian cultures, red represents happiness. Many other fruits and vegetables are red, for example: apples, strawberries, tomato, red pepper, raspberries, grapes, red potatoes, beets, cherries, cranberries, red cabbage, radishes, radicchio, red onions, watermelon and rhubarb. Red is a visually stimulating colour and is used to market and sell many different items. Pomegranates have a spherical shape, with a protruding crown at it’s top. The outer fruit rind maintains it’s shape because of the volume of the seeds inside. The fruit has a thick, sturdy, leather-like rind; the seeds are separated by soft squishy tissue on the inside. The fruit has very minimal give and if pressure is applied will squash or crack. I was instinctively drawn to the pomegranate because it has religious significance for Jews. It is commonly believed by Jewish individuals that the forbidden fruit in the Garden of Eden was not an apple, but a pomegranate. The pomegranate also represents the crown, as the top of the fruit has one. The fruit is also believed to have six hundred and thirteen seeds; which matches the 613 commandments of the Torah. In Judaica stores around the world, there are many different kinds of decorative items with a pomegranate emblazoned on them. I am interested in using the fruit’s shape and colour to explore interior design items for the home. 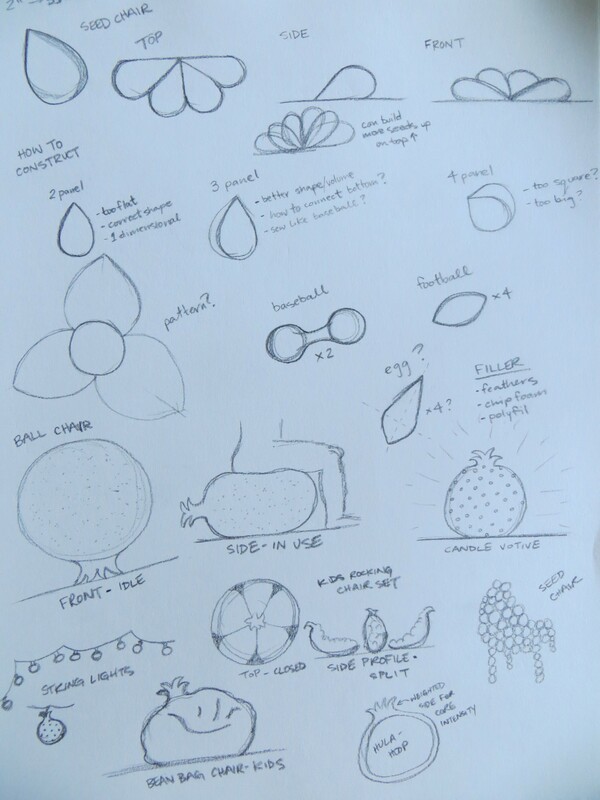 I’d like to expand upon chairs and lighting solutions utilizing the pomegranates shape and playful nature.